London, UK, 15 September 2014 – Canon today unleashes the EOS 7D Mark II, the ultimate DSLR to capture action other cameras simply miss. Building on the class-leading performance of the iconic EOS 7D, and harnessing technologies found in the flagship, professional EOS-1D X, the revolutionary camera is made for speed, with extreme power and performance providing the freedom for enthusiast photographers to shoot a world of ever-changing action. 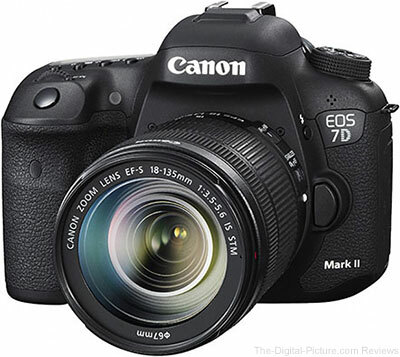 Completely rebuilt and redesigned, the EOS 7D Mark II delivers all the performance of its predecessor – and much more. Made for life’s fastest moments, the camera can capture an incredible 10 frames per second (fps) without a drop in resolution, and together with a new 65-point cross-type AF system¹ and Dual DIGIC 6 processors, the EOS 7D Mark II sets a new benchmark for electrifying speed and power. The EOS 7D Mark II excels in high-speed situations, shooting bursts of an astonishing 10 full resolution images in a single second, thanks in part to a newly designed shutter and mirror drive mechanism, with an incredible 200,000-cycle shutter durability. Whether you’re shooting indoors or outdoors, under natural or artificial light, consistently accurate exposures are achieved with a new 150k pixel RGB+IR metering sensor – the first in an EOS to include infra-red and flickering light sensitivity. A new cutting-edge flicker detection feature ensures images are only shot when light levels are at their brightest level – intelligently analysing the light source and detecting flickering light the eye simply can’t see. Additionally, EOS iTR AF and AI Servo AF III technologies, originally introduced in the EOS-1D X, work alongside the advanced metering sensor to deliver accurate subject tracking. The EOS 7D Mark II builds on its predecessor’s movie reputation with a new suite of pro-standard recording features. Superior AF performance is executed by Canon’s unique Dual Pixel CMOS AF technology, so you can shoot with smooth, accurate focus. In a first for EOS, both Movie Servo AF speed and tracking sensitivity can be customised, giving you complete control for pull-focus effects and transitions between subjects. The camera captures every split second of the action in Full HD quality, with a choice of frame rates from 24p to 60p for smooth movement and slow motion effects. The EOS 7D Mark II is engineered to shoot in the most demanding situations, with improved weather resistance and a tough magnesium alloy chassis – as well as built-in GPS and a digital compass to help you track your adventures. As part of the world renowned EOS System, the EOS 7D Mark II supports a number of accessories, including a new battery grip that enables longer, more stable shooting throughout the day.